Africa is such a beautiful place, from its culture to people to fashion. The hope for the show is to bring positivity to the usual negative reports of bombings and other tragedies associated with the area. The show’s focus is to showcase local design and talent, and bring joy to a city that has been caught up in turmoil. Nigeria is not known for high-class malls, but they do have a love of fashion. 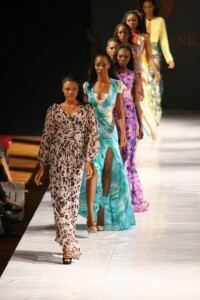 The country has produced some of the world’s best-known designers such as Frank Osodi and Bridget Awosika. Both creative geniuses will be in attendance at the show, as well as Romero Bryan, a Jamaican designer currently based in Britain. Due to the debuting show’s initial success, the number of designers showing last year had increased from 50 to 77. In preparation for the event, two huge tents have been placed on the grounds of a five star hotel as home to the shows. Decorators have been flown in from Europe to create an unforgettable atmosphere. The Lagos Fashion Week is set to run March 6 thru the 11th. This year’s shows are sure to impress those who attend. Big named designers like Oswald Boateng and Kluk CGDT will also be attending, as well as a handful of fresh talent. Africa needs a break from news reports of turmoil going on in their beautiful country. Fashion is an art, and art is a wonderful aphrodisiac. Fashion unites the world through colors, fabrics, and imagination. Cheers to a wonderful week Lagos!